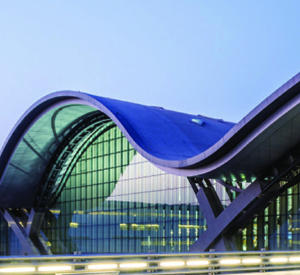 Hamad International Airport is an international airport currently under construction in Doha, capital of Qatar. The first two phases are scheduled to open in January 2014, while the third and final phase is scheduled for 2015. The airport is being built over 22 square kilometers, half of which is on reclaimed land. HIA was designed primarily to deal with the growing volume of traffic at the airport. The airport will be able to handle 29 million annual passengers at its opening, three times as many as the current airport capacity. Upon completion, it will be able to handle 50 million passengers. It is expected to handle 320,000 aircraft movements and 2 million tons of cargo annually. Moving walkways will be installed to handle the traffic. It will have one 3-star transit hotel and one 5-star luxury hotel.